It’s one of the Royal Docks’ favourite annual events. The Dock2Dock 10k open water swim, is now open for registration, with the 2018 event taking place on July 28. 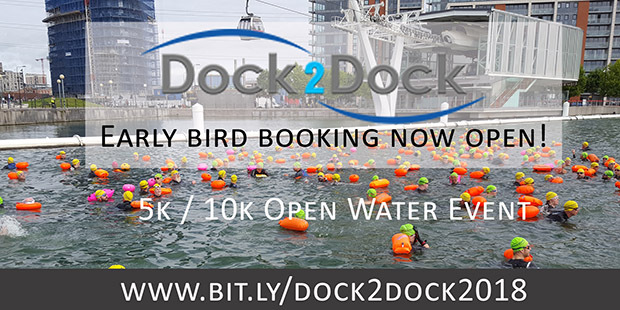 Dock2Dock is organised by Love Sports Events, and due to the expansion of London City Airport, the 10k Race will now involve two laps of Royal Albert Dock and Royal Victoria Dock. To add to the experience, the organisers have now added in a 5km option, which will be one lap of the two docks. London’s unique and historic water race offers a unique opportunity for this open water swimming race in the heart of the vibrant East End of London. The Dock2Dock Race will operate using the NOWCA safety system offering all competitors a safe and enjoyable race. Any swimmer under 18 will require parental permission to swim. Plans for Winter Swimming are now coming together. Summer season ends on 30th September but the great news is that NOWCA Swim has responded to popular demand by offering open water swimming sessions throughout the winter from October 1, 2018, to March 31, 2018. A month-by-month schedule is in the process of being put in place starting on 1st October offering a couple of swim sessions a week. Swimmers will be given the chance to select their sessions in advance and once these dates are confirmed, swimmers can also drop in on the day. Sessions will cost £10 each and will include a hot drink! If you’d like to be added to the Royal Docks Open Water Swimming database to get more information about winter swimming please click on the sign-up button on its homepage, giving you the opportunity to take part in a chilly dip in the Docks this Winter!